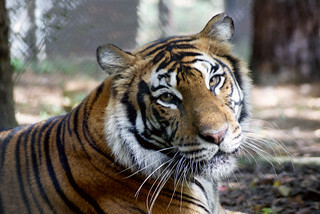 Carolina Tiger Rescue’s physical address is 1940 Hanks Chapel Rd, Pittsboro, NC 27312. Using GPS services may not get you directly to our physical address. See below for directions that will get you right to our facility. After passing Fearrington Village & Galloway Ridge on your left, turn left on Mt. Gilead Church Rd. Turn left on Dee Farrell Rd. Arrive at Carolina Tiger Rescue. The visitor lot is the 3rd entrance on the right. Travel straight through the light at Mt. Gilead Church Rd. Turn left onto Hanks Chapel Rd. Arrive at Carolina Tiger Rescue. The visitor lot is the third entrance on the right.